mini-Kus! 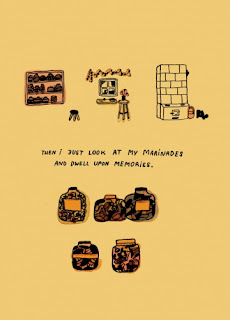 #67: Day Tour, by Mariana Pita. Pita's line is as loose as it gets, cohering around a pleasant arrangement of pastels. 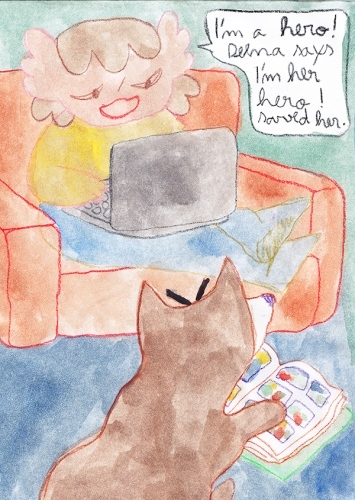 It's about a young woman desperately seeking self-validation and her football-loving talking dog. As she goes to give blood, they have to navigate a busy city made busier by rabid fans ready to take in the match. 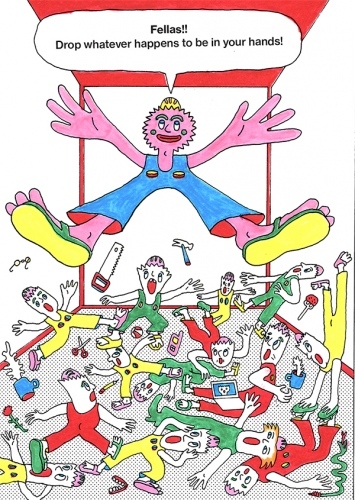 The comic really is about how we choose to confront anxiety and its effects on our everyday life. Simply leaving the house was a big step for the protagonist, much less finishing the job of actually giving blood. Even when she's not able to give a full amount, she knows that she's done everything she can. 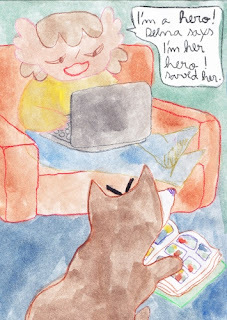 Her dog represents a sort of negation of the search for meaning, as he can't give blood and is obsessed with the game. It's his way of dealing with reality, but he's outside of the camaraderie of fandom and instead faces its more alienating qualties. All of this is done in the most welcoming, friendly prose possible, as it digs into some dark places. mini-Kus! #68: Weekend, by Erlend Peder Kvam. This is as unhinged a comic as I've ever read, with a strange logic that's shouted at a million decibels and intense colors. 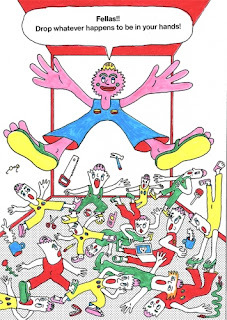 The comic is a combination of brutal satire and sincere weirdness, as a boss with a cultish following among his workers must entertain his twin nephews (?) over the weekend. Every figure is distorted (with lots of foreshortening), has spiky-headed features and threatens to jump off the page. There's even a parody of criticism, as the boss is revolted by the work of one nephew as that of a "try-hard" and is drawn to the silly weirdness of the other nephew. There's no doubt a heavy sense of intentionality to every line and word (done in an electronic font), but it's so deliberately strange and off-putting that it almost dares the reader to engage it. mini-Kus! #69: Maud, by Marlene Krause. 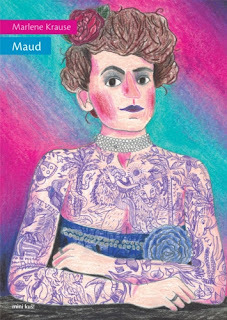 This is a straightforward but interesting biographical comic about Maud Wagner, one of the first female tattoo artists. A circus acrobat throughout her life, she initially agreed to date her future husband Gus in exchange for lessons on how to do the manual "stick and poke" tattoo. Done in bright colored pencil, Krause emphasizes the sheer joy of their interactions as he shared his past as a sailor traveling around the world and she revealed her desire to see the sorts of thing he had experienced. They eventually became well known as a pair of master tattoo artists who were themselves covered in art. Krause does a great job condensing their lives into key moments, including the birth of their daughter Lotteva and Maud extracting a vow that Gus would never tattoo her. As a result, their daughter would become a skilled tattoo artist in her own right, only she never got a drop of ink herself because the only person she ever wanted to do it was her father, and he had died. Those story beats were filled out by more quotidian anecdotes that talked about the yearnings of each character, with beautiful and cartoonish renderings on each page. mini-Kus! 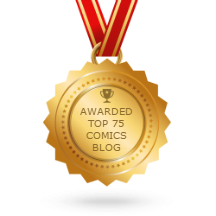 #70: Worms, Clouds, Everything, by Lote Vilma Vitina. Reminiscent of the small renderings of Souther Salazar, this book has dozens of small, scratchy but beautiful drawings of nature as observed by a hermit in the wilderness. The hermit is obsessed with mushroom hunting, from the thrill of the hunt itself to the delicious things he makes to the psychedelic experiences he has by eating certain kinds of fungi. There are some deliberate parallels to the work of Henry David Thoreau here, as the hermit talks about his surroundings and the feelings they invoke in great detail. Color contrasts are important as different pages are on different color stocks, creating different visual effects without the use of very much actual color. This is a comic about filling in the blanks and creating new ways of looking at the world every day.